It’s amazing how the road to ‘making money’ for writers has opened. Maybe you’ve been thinking about it, or maybe you’ve even tried your hand at writing to earn an income or simply to supplement what you already make, but just haven’t seen the light at the end of the tunnel. Well, take a step back, look around, and take a new stab at it, because now’s the time to write for money. The answer to that is simple: any form of writing that provides payment is writing for money. You may ghostwrite articles or books, maybe you write your own articles and books and submit them to publishers, or maybe you write white papers, e-books, newsletters, landing pages, greeting cards, or other content, if you get paid for writing it, it’s writing for money. Writing to earn goes beyond that simple answer above. 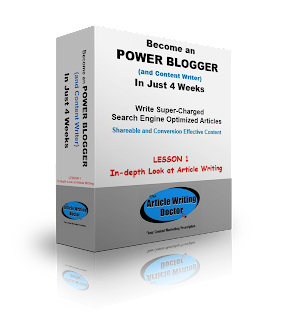 Along with actually being paid for the content you produce, you can also write 300 - 500 word posts for your monetized blogsite or website. While you’re not actually paid for the post content itself, the content will bring you traffic and help build your mailing list from which you have the potential to earn money. The relevancy of the blog post content to the product you’re offering is an important factor for conversion, as is the quality of the content, so keep that in mind. Another important factor is to post your content on a regular basis. You can also use your content writing skills to write for businesses. Content writers are now in high-demand. Conversion is when a visitor to your site actually buys what you’re offering, so you will need to create a webpage that motivates visitors to click on the BUY button. One content format that has tremendous potential to make money is writing and self-publishing e-books. Due to the ease of creation and easy access to self-publishing services such as Amazon’s Kindle, and other services, writers now have a platform to publish e-books with absolutely NO out-of-pocket costs. No more endless submissions and rejections, now you can just write and self-publish in e-book format. And, most of the selling price goes to you - the self-publishing services do take a small percentage of your sales. While being able to self-publish with ease and at no cost is great for writers, it doesn’t necessarily mean you’ll make money. If your intent is to write to make money you will want to produce information e-books. Information is the most effective type of content for earning money. Information content can be in the form of a simple three - five page report or a 100+ page e-book. Whatever the word or page count is you will need to make sure the information you provide is something online searchers are looking for, and it needs to be valuable and polished. How do you determine what people are looking for? To find what online searchers are looking for you will need to do keyword searches. For example: I wrote an e-book on book marketing. I came up with a few titles and then did a keyword search. I found that adding “How to” at the beginning of one of my titles was within my target number of searches, so I titled it How to Attract Customers With Information Marketing. You should be cautioned though that marketing information is an ever-changing topic. What’s relevant and savvy today may be useless six months from now – marketing technology is constantly evolving and therefore marketing strategies are often changing. While some basic marketing information is steadfast, it may be wiser to go with an evergreen topic, like writing, health and fitness, gardening, etc. Along with the possibility of earning an income, creating content and ebooks helps you build authority in your niche. Authority is a very important marketing element. People are more likely to invest with someone they trust and who has authority. Another option with ebooks is to offer writing them as a service to others. Use your persuasive copy to let businesses know they should have their own book to offer to clients, potential clients, employees, and so on. Whichever strategy you use, be sure your content is polished. This means self-editing and proofing your work before you publish it. Just because self-publishing is easy to do and no one is monitoring your writing, your content is still a reflection of your writing ability and your professionalism. Speaking of making money writing . . . This 4 week interactive e-class through WOW! Women on Writing that will train you to write super-charged articles and content that will be shareable, engaging, and will increase conversion. Make it a money-making part of your freelance writer’s portfolio. Or, use it to boost your own home or small business.